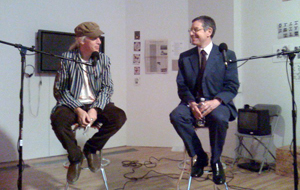 Deitch talks about his history in New York beginning from his early days as an artist in the late 1970s, through his time as an "arts broker" at Citibank, and the last 15 years as owner and director of Deitch Projects in Soho. On the eve of his departure to become Director of LA MOCA, Deitch looks back on New York's changing art scenes and the inspiration he has received from street life and youth culture in the city. Carlo McCormick is a leading New York art writer and a champion of "the downtown scene." He is the author of numerous books, monographs and catalogues on contemporary art and artists, and has lectured and taught extensively at universities and colleges around the United States. His writing has appeared in Aperture, Art in America, Art News, Artforum, Camera Austria, High Times, Spin, Tokion, Vice and countless other magazines. He has curated shows for the Bronx Museum of Art, New York University, the Queens Museum of Art and the Woodstock Center for Photography. McCormick is Senior Editor of PAPER magazine. For decades Jeffrey Deitch has been a paragon of taste and a fierce proponent of contemporary art and its emergence both in New York City and the world at large. Deitch is a dealer in modern and contemporary art and an art advisor to private and institutional art collectors. He is also an art writer and exhibition organizer, having contributed to Arts, Art in America, Artforum, and numerous other publications, and served as the first American Editor of Flash Art. He received an Art Critic’s Fellowship from the National Endowment for the Arts in 1979. Deitch’s first important curatorial project was Lives, a 1975 exhibition about artists who used their own lives as an art medium. It was presented in a vacant office building in Tribeca. His most ambitious exhibition was Post Human, which opened at the FAE Musée d’Art Contemporain in Lausanne in June 1992, and travelled to the Castello di Rivoli in Torino, the Deste Foundation in Athens, the Deichtorhallen in Hamburg, and the Israel Museum in Jerusalem. Prior to opening his own art advisory firm in 1988, Mr. Deitch was a Vice President of Citibank where he spent nine years developing and managing the bank’s art advisory and art finance businesses. Before joining Citibank, he was the Assistant Director of the John Weber Gallery in New York and then the Curator of the De Cordova Museum in Lincoln, Massachusetts. After a long career in New York, he will start as Director of the Los Angeles MOCA in June 2010.